The cover has a stretch Lycra® top material that is a durable heavy weight fabric, with a soft feel. The side material is composed of a 3-layered knit polyester spacer fabric, which provides superior air circulation that ventilates and cools the user. The fluid proof, solid, non-skid base material offers a durable easy to clean surface. 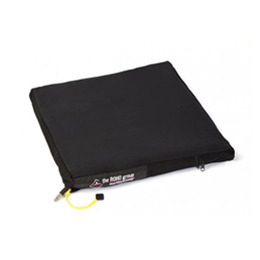 The cover has the added feature of Velcro® straps placed on the bottom, to allow the user to attach the cushion to their chair. ll sales are FINAL on all cushion covers. Velcro® is a registered trademark of Velcro Industries BV.